The song "Tamagawa" ("Tama River") was written and performed by a Nagauta ensemble for the first time in September 1908 in Shinbashi (Tôkyô). Later on, it became a Buyô dance. This song beautifully depicts the scenic charm of the Tamagawa shoreline in Tôkyô. 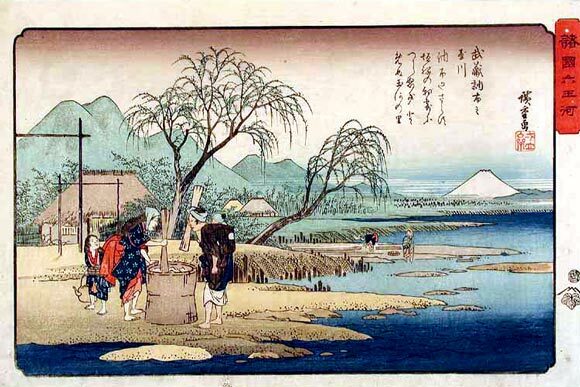 In this song are expressed the feeling from the silent mountains, the tranquillity of the country, the flow of the river, and the songs sung as dyes from fabric are washed away in the river.